Helps reduces the appearance of fine lines. Provides soothing hydration and UV protection. With Skin Renewal Complex which activates surface cell renewal to reveal younger looking skin. Dermatologically tested, smooth and silky, non-greasy formula. This anti-ageing moisturiser is ideal for women aged 40+. 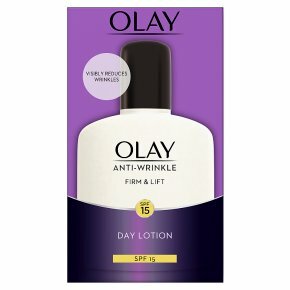 Laugh in the face of wrinkles with our Anti-Wrinkle day lotion. This moisturiser provides instant radiance and long term firmness while reducing the appearance of fine lines and wrinkles. This daily moisturising fluid also provides UV protection (SPF15) to help prevent premature skin ageing day after day. With its proven Skin Renewal Complex, combining anti-ageing ingredients, Niacinamide and Pro-Vitamin B5, this range of face care products works to visibly reduce lines and wrinkles in just 14 days, while also helping to firm the skin. Apply this moisturiser onto your face and neck in gentle circular motion. For external use only. Avoid<br>contact with eyes. If<br>product gets into eyes, rinse<br>thoroughly with water.